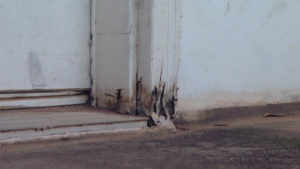 If your exterior door frame looks like this one, there are several repair alternatives. Repairing exterior door frames can be very expensive. You could replace the entire frame and perhaps even the door. Depending on your decision, a new door will cost several hundred dollars or more. Fancy doors will cost in excess of a thousand dollars. Remove damaged parts. Make sure you remove all of the rotted wood. Replace it with a piece of wood that matches the area you are removing, caulk and paint. When you do this work yourself it can be very inexpensive. We will cover this step in more detail in the next section. The following steps can make your door look like new again and cost very little. The outside frame is also refereed to as the brick mold. Once you are satisfied with the fit, pre-drill two holes for the screwnails you will use to secure the new piece of wood. Although time consuming, do it yourself consumers may only spend $20 or $30 instead of hundreds or thousands of dollars.